March 18, 1915: Engineering Newsarticle. Liquid Chlorine at the Bubbly Creek Water-Filtration Plant. By C. A. Jennings. “The Bubbly Creek filter plant at the Chicago Stock Yards set the lead in the use of hypochlorite of lime in this country for water disinfection. This was during the summer of 1908. Subsequently experiments were begun at this plant with an electrolytic cell for the production of chlorine from salt brine. These experiments were carried out very extensively and thoroughly. The writer finally concluded that in comparison with hypochlorite and liquid chlorine, the production of chlorine for water disinfection by means of an electrolytic cell was expensive, uncertain and demanded considerable attention. There is considerably less labor involved. The absorption of the gas by the water is more rapid. There is no loss of chlorine, and smaller quantities can be used to accomplish equivalent results. There is no deterioration of the chlorine in the cylinders while using or while stored. The changing of the rate of application is easily, quickly and accurately accomplished. There is no odor of chlorine about the plant. The cost is considerably less. Reference: Jennings, C.A. 1919. “Liquid Chlorine at the Bubbly Creek Water-Filtration Plant.” Engineering Newsarticle 73:11(March 18, 1915): 555. Commentary: Jennings is one of the engineers who spread the myth that chlorination of water at the Bubbly Creek plant was somehow a breakthrough for water disinfection. Publications by him and the man who wrongly claimed credit for the first use of chlorine in drinking water (George A. Johnson) resulted in Dr. John L. Leal not receiving the proper credit for his work at Boonton Reservoir on the Jersey City, New Jersey water supply in 1908. The water from the Bubbly Creek plant was fed to cows and pigs and was not considered suitable for human consumption. This entry was posted in Uncategorized, Year 7 TDIWH and tagged Bubbly Creek, chlorine, drinking water, public health, water, water history on March 18, 2019 by safedrinkingwaterdotcom. September 3, 1908: First day of chloride of lime (chlorine) testing at the Union Stockyards Filtration Plant. The water source was the foul, polluted Bubbly Creek, a tributary to the Chicago River. The water produced during the test was used to provide water to cows and pigs. George A. Johnson who was involved in the test claimed that he was responsible for the first large-scale use of chlorine in water in the U.S. The following excerpt from The Chlorine Revolution: Water Disinfection and the Fight to Save Livesdemonstrates that his claim was bogus. Much is made in subsequent histories of the early use of chlorine and Johnson’s role in the addition of chlorine to the Bubbly Creek plant that also occurred during 1908. In several exchanges with Mr. Edwards (direct examination) on October 5, 1909, the thirty-fourth day of testimony during the second phase of the trial, Johnson described his role at the Bubbly Creek plant in 1908. “Q. Did you have charge of the first plant at Bubbly Creek in the stock yards in Chicago, and the purification of waters therefrom? Johnson was under oath and he chose his words carefully when he answered the question. It is clear, that his work on the Bubbly Creek plant was a test and not a full-scale demonstration of chlorine disinfection technology, nor was it anything approaching a continuous use of chlorine to disinfect a water supply for human consumption. The Bubbly Creek plant consisted of coagulation with lime and iron or alum followed by sedimentation for three hours. The settled water was treated with chloride of lime at an available chlorine dose of more than 1 ppm followed by filtration through a sand filter. Johnson’s testimony then described the source of water for the Bubbly Creek plant. “Q. What is the character of the water treated so far as pollution is concerned? It is a branch of the Chicago river. It has been notorious for a great many years and was given the name of Bubbly Creek by reason of the fact that gas is rising over the entire surface all of the time. The water which flows through this creek is merely the drainage from seventeen thousand acres of southeastern Chicago and on this area there is resident about 200 thousand people. The sewage from this area and the street washings also are discharged in this creek. “Q. What is done with this water after it is treated? A two-page paper published obscurely in 1909 could have set the record straight on what actually happened at the Bubbly Creek plant if anyone had read it. It was written by Adolph Gehrmann who was part of the two-man team doing the tests on the Bubbly Creek plant. Because the “fourth period of test” at the Union Stock Yards was carried out in September 1908 and Johnson had been working with Fuller since July 19, 1908 on the full-scale Boonton plant, it is not hard to figure out where Johnson got the idea to test chloride of lime. It is highly unlikely that he figured out all on his own that chlorine should be added to the Bubbly Creek plant sometime in May 1908. In 1910, an article appeared in Engineering News which reviewed all of the issues associated with the construction of the Bubbly Creek treatment plant and the use of the water from the plant. 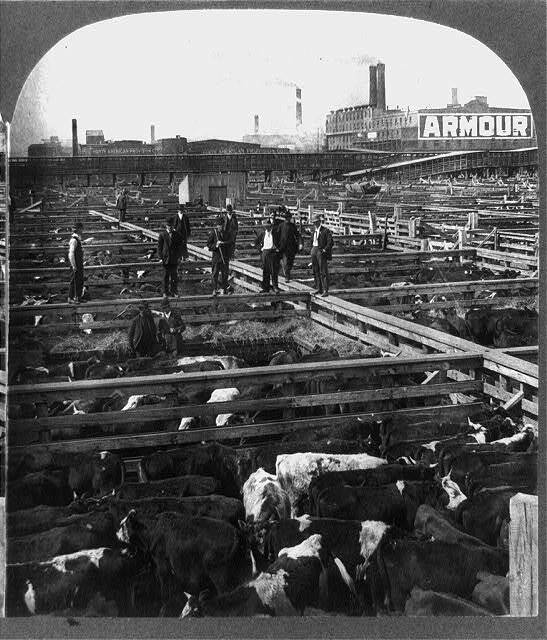 In 1909, a lawsuit was brought by the City of Chicago against the Union Stock Yard company to discontinue use of any water from the Bubbly Creek treatment plant for any purposes related to watering cattle. In the trial, the City claimed that water from the plant was being consumed by people in direct conflict with any imaginable iota of good sense. A key point in the case was that cattle producers believed that their cattle put on less weight when they were given water from the Bubbly Creek plant as opposed to City water. The company denied their contention but agreed as a smart business practice to stop using the water. The treatment plant was subsequently shut down. Johnson wrote and had published in Engineering Newsthree weeks later a 5,000 word letter defending the Union Stock Yard company and himself. Along with his creative use of the calendar and a few facts, his defense was not persuasive. In 1913, Johnson once again tried to make the case that the water treated from the foul Bubbly Creek was as good as other water from polluted sources. His arguments were not convincing. Therefore, Mr. Johnson’s testimony and Gehrmann’s paper showed that for a few days in September 1908, Johnson was a refereeat a testof chloride of lime at a Chicago treatment plant treating raw sewage to act as a water supply for cattle. According to Johnson, he recommended this test in May 1908 although the actual tests did not take place until four months later, September 3 to 17, 1908. Dr. Leal stated in his testimony that he devised his chloride of lime alternative treatment for the Boonton water supply on or shortly after May 1, 1908. Between Jersey City and Water Company, October 5, 1909, 6668-6670. Between Jersey City and Water Company, October 5, 1909, 6674. Between Jersey City and Water Company, October 5, 1909, 6672-6673. Gehrmann, “Experiment in Chemical Purification,” 120. Baker in Quest on page 339 stated that some testing with hypochlorite was done during the third testing period from July 27 to August 2; however, Gehrmann’s article makes it clear that no hypochlorite was tested during that period. Gehrmann, “Experiment in Chemical Purification,” 121. “Water Purification Plant of the Chicago Stock Yards,” 245. Johnson, “Sanitary Significance Common Constituents,” 67. September 3, 1892: First Shovel of Dirt in Construction of the Chicago Sanitary and Ship Canal.“The Sanitary and Ship Canal ran from the South Branch of the Chicago River at Robey Street (now Damen Avenue) to Lockport, a distance of 28 miles in 1900. The channel had a navigable depth of more than 20 feet; its width varied between 110 and 201 feet. Construction on this section, begun in 1892, took eight years to complete and was divided into three sections: an earth section from Robey Street to Summit; an earth and rock section between Summit and Willow Springs; and a rock section from Willow Springs to Lockport. In 1900, the canal ended at a dam in Lockport, which allowed for water to flow southward but precluded navigation. Between 1903 and 1907, the canal was extended to Joliet. A navigation lock and a powerhouse respectively overcame the navigational obstacles and exploited the water power possibilities, of a 34 foot drop between Lockport and Joliet. Commentary: Even though these two events happened 16 years apart, it showed how important Chicago was in the water picture of the U.S. at the turn of the 20thcentury. This entry was posted in Year 7 TDIWH and tagged Bubbly Creek, Chicago River, chloride of lime, drinking water, public health, Union Stockyards, water, water history on September 3, 2018 by safedrinkingwaterdotcom. March 18, 1915: Engineering News article. Liquid Chlorine at the Bubbly Creek Water-Filtration Plant. By C. A. Jennings. “The Bubbly Creek filter plant at the Chicago Stock Yards set the lead in the use of hypochlorite of lime in this country for water disinfection. This was during the summer of 1908. Subsequently experiments were begun at this plant with an electrolytic cell for the production of chlorine from salt brine. These experiments were carried out very extensively and thoroughly. The writer finally concluded that in comparison with hypochlorite and liquid chlorine, the production of chlorine for water disinfection by means of an electrolytic cell was expensive, uncertain and demanded considerable attention. Reference: Jennings, C.A. 1919. “Liquid Chlorine at the Bubbly Creek Water-Filtration Plant.” Engineering News article 73:11(March 18, 1915): 555. This entry was posted in Year 6 TDIWH and tagged Bubbly Creek, chlorine, drinking water, public health, water, water history on March 18, 2018 by safedrinkingwaterdotcom. September 3, 1908: First day of chloride of lime (chlorine) testing at the Union Stockyards Filtration Plant. The water source was the foul, polluted Bubbly Creek, a tributary to the Chicago River. The water produced during the test was used to provide water to cows and pigs. George A. Johnson who was involved in the test claimed that he was responsible for the first large-scale use of chlorine in water in the U.S. The following excerpt from The Chlorine Revolution: Water Disinfection and the Fight to Save Lives demonstrates that his claim was bogus. A. It is a branch of the Chicago river. It has been notorious for a great many years and was given the name of Bubbly Creek by reason of the fact that gas is rising over the entire surface all of the time. The water which flows through this creek is merely the drainage from seventeen thousand acres of southeastern Chicago and on this area there is resident about 200 thousand people. The sewage from this area and the street washings also are discharged in this creek. Johnson wrote and had published in Engineering News three weeks later a 5,000 word letter defending the Union Stock Yard company and himself. Along with his creative use of the calendar and a few facts, his defense was not persuasive. Therefore, Mr. Johnson’s testimony and Gehrmann’s paper showed that for a few days in September 1908, Johnson was a referee at a test of chloride of lime at a Chicago treatment plant treating raw sewage to act as a water supply for cattle. According to Johnson, he recommended this test in May 1908 although the actual tests did not take place until four months later, September 3 to 17, 1908. Dr. Leal stated in his testimony that he devised his chloride of lime alternative treatment for the Boonton water supply on or shortly after May 1, 1908. 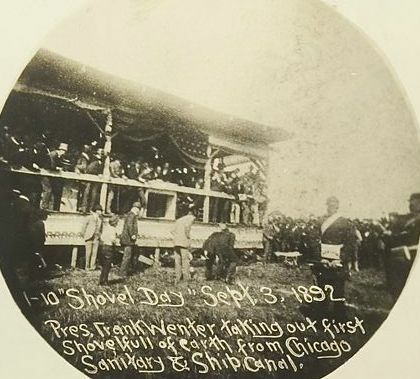 September 3, 1892: First Shovel of Dirt in Construction of the Chicago Sanitary and Ship Canal. “The Sanitary and Ship Canal ran from the South Branch of the Chicago River at Robey Street (now Damen Avenue) to Lockport, a distance of 28 miles in 1900. The channel had a navigable depth of more than 20 feet; its width varied between 110 and 201 feet. Construction on this section, begun in 1892, took eight years to complete and was divided into three sections: an earth section from Robey Street to Summit; an earth and rock section between Summit and Willow Springs; and a rock section from Willow Springs to Lockport. In 1900, the canal ended at a dam in Lockport, which allowed for water to flow southward but precluded navigation. Between 1903 and 1907, the canal was extended to Joliet. A navigation lock and a powerhouse respectively overcame the navigational obstacles and exploited the water power possibilities, of a 34 foot drop between Lockport and Joliet. Commentary: Even though these two events happened 16 years apart, it showed how important Chicago was in the water picture of the U.S. at the turn of the 20th century. This entry was posted in Year 6 TDIWH and tagged Bubbly Creek, Chicago River, chloride of lime, drinking water, public health, Union Stockyards, water, water history on September 3, 2017 by safedrinkingwaterdotcom. March 18, 1915: Engineering News article. Liquid Chlorine at the Bubbly Creek Water-Filtration Plant. By C. A. Jennings. “The Bubbly Creek filter plant at the Chicago. Stock Yards set the lead in the use of hypochlorite of lime in this country for water disinfection. This was during the summer of 1908. Subsequently experiments were begun at this plant with an electrolytic cell for the production of chlorine from salt brine. These experiments were carried out very extensively and thoroughly. The writer finally concluded that in comparison with hypochlorite and liquid chlorine, the production of chlorine for water disinfection by means of an electrolytic cell was expensive, uncertain and demanded considerable attention. This entry was posted in Year 5 TDIWH and tagged Bubbly Creek, chlorine, drinking water, public health, water, water history on March 18, 2017 by safedrinkingwaterdotcom. This entry was posted in Year 5 TDIWH and tagged Bubbly Creek, Chicago River, chloride of lime, drinking water, public health, Union Stockyards, water, water history on September 3, 2016 by safedrinkingwaterdotcom. This entry was posted in Year 4 TDIWH and tagged Bubbly Creek, chlorine, drinking water, public health, water, water history on March 18, 2016 by safedrinkingwaterdotcom.